"Do I turn it on or off? Maybe I'll run a fan." When I lived in Las Vegas for fourteen years, we always had a programmable thermostat to control the heat in the winter and the air conditioning in the summer. 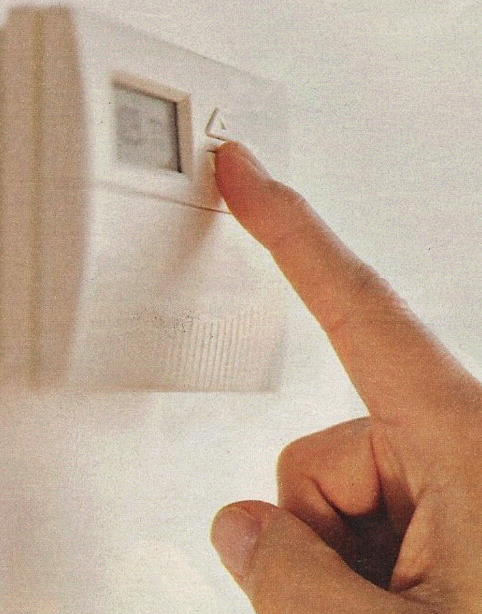 In the Midwest, most people comprehend the heat side of the device, but they freak out when it comes to using the air conditioning in the summer. In the Midwest, everyone is obsessed with the weather forecast. During the newscast, they have weather about six times prior to the actual weather forecast. There is "First Weather" "Quick Weather" "Bus Stop Forecast" "Weather Preview" "Coming up next in Weather" - then... FINALLY, the weather. People you don't even want to know will tell you, "It's going to be 79 today." I didn't ask and I don't care. In Las Vegas, the weather forecaster had nothing to do. It's sunny EVERY day. Clouds show up a few times a year and everyone gets real excited. If the temperature is 85 on Monday, it will probably be getting hotter the closer we get to summer. If it's 85 and we're heading toward Christmas, it will probably be getting cooler. The only weather event that everyone hates in Las Vegas is the wind. Wind is like a "Snow Day" in the Midwest. No one wants to go out. Too much blowing dust - and that stuff hurts when it smacks your face. Vegas weather forecasters are so bored because there isn't even anything on the radar. They fill their time by telling you about the weather in other parts of the country. Most Vegas weather forecasters got their jobs because they didn't have enough energy to do the sports reports. In the Midwest, though, they have TEAMS of forecasters. Yes, one of the morning programs has two meteorologists. TWO. As if one dummy can't tell us, "It's going to be 79 today." In Vegas, we'd set our programmable thermostat and let it go. In hot months, we'd set it about 78. In cold months, we'd set it about 68. If the A/C or heat was not running, we opened the windows. Not the case here in the Midwest. Turning on the A/C is a family debate. It can even escalate into an argument. "Maybe we'll keep the windows open a little longer. We don't want to run up the electric bill." In the meantime, the humidity is 94% and sweat is running down my underwear. Humidity screws everyone up here. After watching all the maps, radar, isobars, barometric pressures and a bunch of H's and L's on a huge map, the temperature is forecast. Most people think that you don't put the A/C on until it gets over 80 or 85. But it can be 78 and the humidity can leave you dripping. "I don't know why I'm sweating, the windows are open." TURN ON THE DAMN A/C!!!!!!! Once the family council determines that it is hot enough and sweaty enough to turn on the A/C, they set it for 65. Now, everyone in the house is wearing a sweatshirt. It's freezing!!! Rather than bump the thermostat up a few degrees and see if we can find a comfort zone, they turn it up to 78, "Because it was just getting too cold in the house." An hour later everyone is sweating again. Midwest residents are so paranoid about running up the electric bill with their A/C. They'll call friends and relatives to see if they are going to turn on their A/C. "Are you turning on your A/C today?" "No, I have the windows open. And this humidity is killing me." "I turned on my A/C last night and slept in flannel pajamas and a robe." "I slept with the windows open, but I was stuck to the sheets from all the sweat. Let me call you back. I think I'm going to turn on my A/C." "Hi, it's me again. I set it at 70. What temperature did you set your A/C at?" "I've got mine at 72." "Are you sure? Maybe 70 is too cold. I don't want to run up the electric bill." "My sister keeps hers at 78, but then she has four oscillating fans running at the same time." "Don't those fans run up the electric bill." "I think so, but she's not wasting her money on A/C. I think I'll turn mine off for half an hour or so to save energy." "Are you going to turn it off now or later?" "Now, but I'll put it back on later." "I'll call you or send you a text message." "Did you know that Doris runs her A/C at 65?" "I always knew she thought she was made of money. Her and her husband are nutcases. I think they freeze meat in their living room." "Yeah, 65 is too much, unless you use a space heater. That takes the edge off." "Let me call you back. The A/C is about to kick on and I better shut it off before it starts blowing." "OK... but call me if you are going to turn it back on." No one uses the thermostat. They turn the whole system ON, then OFF. My father was the worst. His condo had a bathroom that had no windows and was centrally located in the house. His bedroom was adjacent to it. I think the two rooms had some kind of geothermal effect going on, because it was always comfortable to him. Meanwhile, my wife and kids are upstairs sweating our asses off. No one in the Midwest understands that heat rises, either. "But there's a fan up there. Is that all you can do is complain? This isn't Las Vegas, you know." Yeah, in Las Vegas, we are the masters of environmental control. Here, it's freeze, thaw, freeze, thaw - and that's in the middle of summer. The grass is brown and plants are dying and everyone is standing by the thermostat wondering what to do. That's because people in the Midwest are freaked out about air conditioning. Some of that Mid-west thing has gotten to my Wife casuse she puts the AC on 66 at night and it 70 degrees outside, I go outside just to get warm and wear a jacket all day - IN THE HOUSE!. 100% true. All of this. However I've got the concept that heat rises. #WisconsinBoy here. Thanks for the compliments... I'm never opposed to people passing on the stuff they love. Don't keep laughter to yourself. Share it. Often. Funny, I grew up in St. Louis, and we never were like that. I guess it's part of the creative license to exaggerate. I posted about weather in the ZtoA in May challenge. Check out Steve Carroll's weather forecast. Pretty funny.